The 2014 National Curriculum for England is less detailed than prevous versions - at Key Stage 3 it describes a common core for each subject that teachers are free to embellish and augment as they see fit, and at Key Stage 4 it just says that Computing should be taught but gives no further detail. The following list of topics (with links to free resources) is more a specification or programme of study than a scheme of work, but it represents what I would like students to know by the time they leave school. The list includes, and expands upon, those topics included in the National Curriculum for Computing. If students get a good grounding in the theory at Key Stage 3, you will find that there is actually very little left to cover for GCSE Computer Science, and you can concentrate on practising programming techniques for the controlled assessments and revising for the exam. Notice that I don't see "computational thinking" as a separate topic - it's more a side-effect of having sound knowledge and understanding of the other topics in the curriculum, and being able to link them together. Some of these topics are of conceptual interest, while others, such as wireless networking, will be of practical use in the home or workplace. I have grouped them to facilitate assessment and reporting. Links are to pages within this site, PowerPoint shows to introduce topics to the class, or to resources and examples I have created in other sites such as Scratch and Repl.it. There are also supporting blogs and a YouTube channel. One of the reasons that I prefer KS3 Computing to the old KS3 ICT curriculum is that the topics link to form a coherent whole, and my students appear to like that too. In Visible Learning, John Hattie identifies linking areas of the curriculum as one of the top ten most-effective teaching techniques, and empirical evidence suggests that this is something that teachers from a non-Computing background struggle to do. 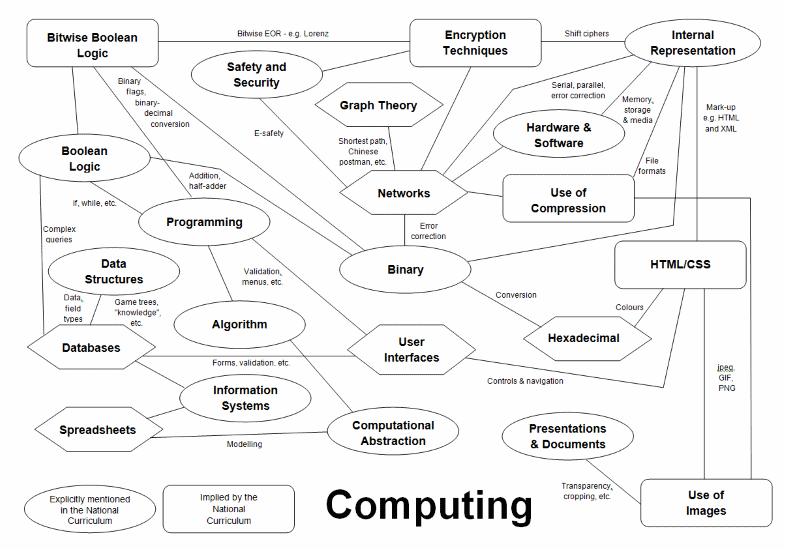 I have therefore also created a Computing curriculum concept map to show how these topics are related and what links them together. Hattie also makes the point that buying, or using, someone else's scheme of work makes teachers less effective because they spend less time thinking about the curriculum as a whole, and that teachers and departments that create their own curriculum or scheme of work have more "impact". That is why the resources on this page are presented in no particular order - it is important that you think about how these ideas are related, and create a sequence that would best suit your own students. I have written an article to help you, which explains how I think that the representation of data links the whole of Computing. Bitmap formats (GIF, jpeg, PNG, etc.) - comparison of size, features, alpha, etc. Wave formats - Ogg Vorbis, MP3, FLAC, etc. Relationships - one-to-one, one-to-many, etc. When students are working on programming topics, I also sometimes give them logic puzzle starters. Internet connections: ADSL, FTTC, FTTH, etc. Transmission (parallel/serial) and error detection - parity, etc. Card Flip Magic (parity game) or Card Flip Magic (with digits) - click/tap to flip the cards, press a key or touch with two fingers to add parity bits; challenge a student to flip a card while you look away, it's the card in the row and column with the odd number of black cards (or 1s). Use of :hover for menus, rollovers, etc. Use of DIVs - no tables for layout! Does technology have an adverse effect on academic achievement? There are examples - particularly of the e-safety and cybersecurity elements of the course - in the news all of the time. The best examples are included on the Impact page, but for the latest examples look for the feeds on Twitter or Facebook. There are examples of programming techniques, plus tasks and solutions, on the Learn to Program and OCR Coding Challenges pages. Finally, there are longer discussions of some topics (and relevant pedagogy, etc.) on the Computing and ICT in a Nutshell blog. While it's better to design your own scheme of work, I appreciate that some non-specialists will struggle to do so. I have created a second page to show the order that I teach these topics in the first year of my KS3 Computing course, and here I describe how the curriculum map can be used to create a scheme of work. There are also extra resources available on the Computing and ICT in a Nutshell YouTube channel. For assessment, I used a set of skill statements adapted from the CAS progress pathways document but I don't bother with the colours or numbering the levels - I record whether the student is sometimes successful at performing the named skill, or whether than can do it confidently and consistently. You can already read my thoughts on measuring progress on the Computing and ICT in a Nutshell blog.